On January 28th, my friend Cassandra turned 20! To celebrate, I cooked up a little feast, which culminated in this birthday cake. It was something of a change from the rest of the meal, which was more Eastern European-themed (mushroom soup, carrot, cucumber and beet salads, and stuffed cabbages). The cake consists of a vanilla genoise with an almond dacquoise sandwiched in between. 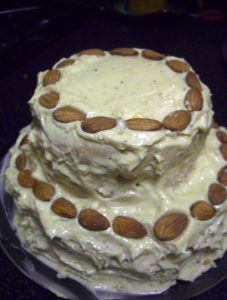 The entire thing is then smothered in almond buttercream. I wanted to make a layer cake, but with only 4 guests, this seemed a bit excessive, so I used miniature cake pans for a smaller cake (they were 7.5″ and 5.5″ in diameter). Genoise is typically a dry cake and is therefore drizzled with syrup, although I forewent that step because I was pressed for time. Dacquoise is similar to mergingue in texture, so it adds a nice crunch in the middle of the cake (my favourite part, in fact). However, you should eat the cake immediately, as some of the moisture from the genoise is absorbed by the dacquoise and it loses its crunch after a day or two. 1. Preheat the oven to 300oF. Lightly butter the bottom and sides of one half-sheet pan. Using a 9-inch cake pan as a guide, trace 2 circles on a sheet of parchment paper, cut to fit the half-sheet pan. Place each sheet, circle side down, on the pan. Butter the paper, then dust with flour. 2. In a food processor, combine the almonds, 1/4 c of the granulated sugar, and the cornstarch. Process until the almonds are ground to a powder. 3. In a large bowl, beat the egg whites on medium-high speed until they form soft peaks and have tripled in volume. Slowly pour in the remaining granulated sugar and vanilla and beat until the whites are stiff and glossy, being careful not to overwhip. 4. Pour the almond-sugar mixture over the egg whites and quickly fold in with a rubber spatula. Spoon the batter into a pastry bag fitted with a 1/2″ tip. Starting in the middle of one of the traced circled, pipe spirals of batter until you reach the each of the circle. Repeat for the second circle. 5. Bake the layers until they are crisp and dry and begin to brown, about 50-60 minutes. They will feel crisp on the top and will crisp completely after the are cooled. Transfer to wire racks to cook completely. 1. Preheat the oven to 350oF. Butter a 9-inch cake pan and line the bottom with a circle of parchment paper cut to fit. Butter the paper and dust the bottom and sides of the pan with flour. 2. Sift the flour onto a plate and set aside. Put the eggs and sugar in a deep stainless-steel bowl and set over a saucepan filled halfway with water. Bring the water to a simmer. Gently stir the eggs and sugar with a whisk for several minutes, until the sugar is completely dissolved. 4. Sift the flour over the batter and fold in with as few strokes as possible. When the flour is nearly incorporated, quickly fold in the butter and vanilla as well. 5. Bake the cake until it springs back lightly when touched with a finger tip and a toothpick inserted into the centre comes out clean, about 20-30 minutes. Remove the cake from the oven, and immediately run a small knife around the inside of the pan to loosen the cake. Place a wire rack on top of the cake and invert them together. Peel the parchment off of the cake, turn it back over onto the rack and let cool completely. 1. With a wire whisk, stir the egg yolks together in a bowl. Set aside. 2. In a small saucepan, combine the sugar and water and bring to a boil over medium-high heat. Continue to boil until the syrup reaches the soft-ball stage (239oF on an instant-read thermometer), about 5 mins. 3. When the syrup is ready, begin to bead the egg yolks with a mixer on medium speed. While beating, carefully pour the hot syrup onto the yolks. Beat until all of the syrup is incorporated, and continue to beat until the mixture is cool and thick. 4. Beat the butter into the mixture until smooth and satiny. If the mixture looks curdled and the bowl feels cold, warm it over hot water and beat again. Beat in the espresso, amaretto and almond extract. Slice the genoise in half using a serrated knife. Sandwich one dacquoise piece between the layers and place another on top. Cover the entire thing with frosting, and garnish with toasted almonds.